Golden rays of light filter through the clouds suspended on sharp mountainous peaks, drawing an unreal and subtle ambience. Lush and high islands emerge from the Pacific Ocean, a land of history and legend, all as fascinating as unforgettable. Welcome to “The Land of Men,” the Marquesas Islands. 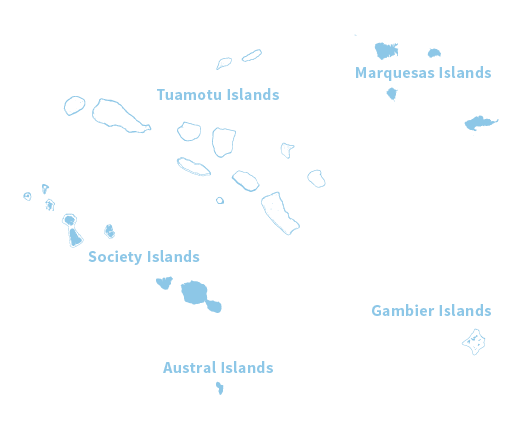 The Marquesas are located 932 miles (1,500 km) northeast of Tahiti and spread out over 12 islands, of which only six are inhabited. Framed by looming cliffs, the coasts of the Marquesas Islands are a mix of black sand beaches and gorgeous bays. In the lush rainforest, where thousands of pre-European remnants lie, you’ll discover wild horses, goats and bores. Nature is raw and its charm even stronger. 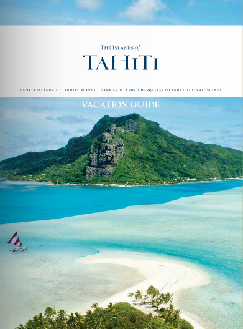 From Taipivai Valley to Hatiheu Bay, from Anaho to Hakaui (Vaipo, the highest waterfall in The Islands of Tahiti), the traveler is invited to admire cultural and natural wonders. 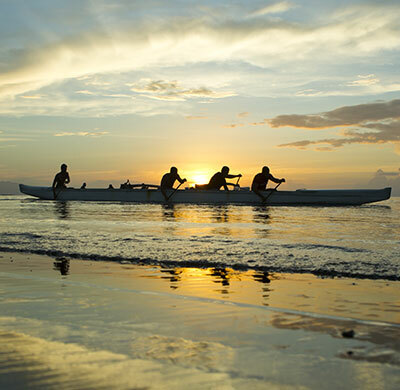 The Marquesans are said to be among the finest craftsmen throughout French Polynesia. They create large and fine carvings, beautiful tattoos, surprising pieces of jewelry. This is the story of a sailor who was attempting to flee a boat, a boat he detested. He secretly disembarked on a hard, impenetrable island. He wandered around alone but was soon welcomed by the Taipi clan. However he was afraid they were cannibals. Not only did they treat him well (nor eat him!) but they also allowed him – as the first European ever – to discover their unknown and untouched community. It was in 1842. Today, following his steps is a mystical pilgrimage as the valley hosts hundreds of remnants such as tiki and petroglyphs in a timeless atmosphere. Although Nuku Hiva is not thought to be a great scuba diving destination, it is, in fact, quite thrilling. The geographical isolation of the island has allowed a phenomenal biodiversity to develop. In the open ocean, encounter an abundance of manta rays, eagle rays, sharks of various species and sizes, jackfish, tuna, dolphins and swordfish. A pod of several hundred melon-head dolphins live close to the coast and can often be seen. In 1901, Paul Gauguin and later in 1975, Jacques Brel, both came to Hiva Oa in quest of what could be referred to as personal inner peace. While we don’t know if they ever found it, every morning, as the sun rises, the light over the island is breathtakingly pure, so pure that you feel like you’re part of eternity. This is an unspeakable feeling that every traveler will experience. Walking these same artistic footsteps includes visiting their graves at the Calvaire cemetery where they both rest facing Taaoa’s Bay under the sweet fragrance of frangipani trees. Then, visit the replica of Gaugin’s “Maison du Jouir” and the small museum dedicated to the painter and his house. While he lived in the Marquesas, he painted some of his most famous artwork, sourcing his inspiration through the islanders’ every day life but also legends and old religious traditions representing imaginary scenes. Hiva Oa is worth visiting for its various archeological sites such as me’ae in Puama’u, hosting the largest tiki statue of The Islands of Tahiti. “Takaii” (8 feet / 2.4 meters) is a one-of-a-kind smiling statue, hidden in lush vegetation. Petroglyphs, such as the female travel Chief’s polished stone mirror, are in the surrounding area. Taaoa is home to a huge cult area featuring lithic structures and tiki statues nicely blending within the untouched and primitive nature around them: giant banyan trees, breadfruit trees, coconut and papaya trees. Whether you go hiking, horseback riding or on a 4WD ride, explore the pristine and breathtaking landscapes of Hiva Oa featuring waterfalls, peaks, fording and crossing rivers. It’s 123 square miles of enjoyment for nature lovers. 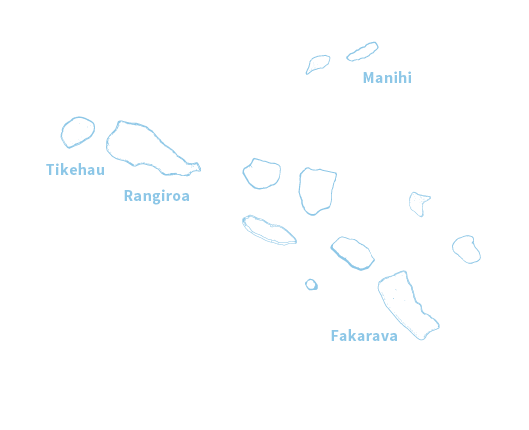 If God had a “big house” symbolizing the Marquesas Islands, the largest of them – Nuku Hiva – would represent the top of the framework. The vertiginous volcanic peaks and amazing slopes blend with the blue of the Pacific Ocean. A special universe opens its doors. 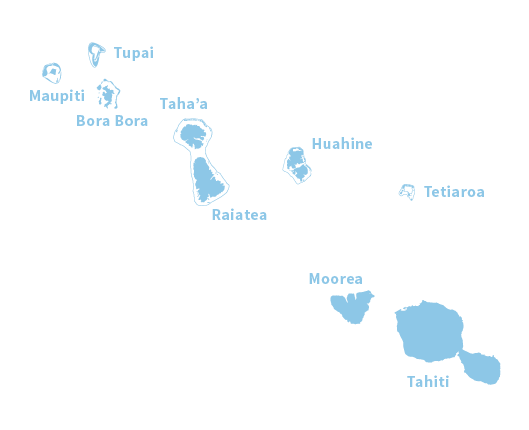 The starting point of your adventure is Taioha’e, the archipelago’s regional capital, opening at the end of a large bay holding the same name. outstanding landscapes, an incredible archeological history, great stories and a rich culture are all to be discovered alongside a friendly population. Ua Huka symbolizes the “food basket” at God’s house and features more untouched beauty and is renowned for its dry soil and landscapes. Wild horses gallop as far as the eye can see around this desert-colored land. Goats climb up on the island’s high plains. 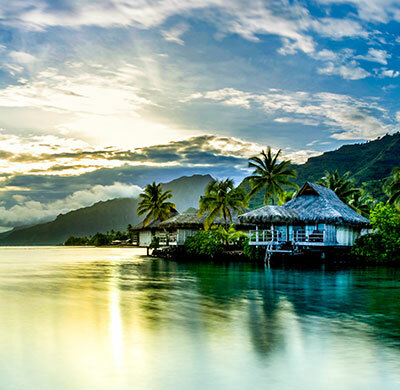 Peaceful and mystical, Ua Huka invites the traveler to discover a secluded universe, where the island’s ancestors are not just a part of the past but still very much part of the islanders’ everyday life. Tahuata symbolizes “sunrise” or “the enlightening home” at God’s house: a poetic image expressing reality so well. Small, Tahuata’s only access is by sea from Hiva oa. The island offers charming discoveries to the privileged traveler. From its fertile valleys to its crystal clear bays, Tahuata is an exquisite haven of peace, a place of history and creativity. Most inhabitants make a living out of their remarkable fine artwork, such as bone and rosewood – or miro (Thespesia populnea) carving. Mono’i is made following the scents of traditions and secrets, like an invite to a mesmerizing perfume beautifully named “love potion” by the islanders. Fatu Hiva symbolizes the roof of Gods’ house: a small but stunning island. Arriving by sea, you’re greeted by sheer landscapes and pristine vegetation. Fatu Hiva will mesmerize visitors. In 1937, Thor Heyerdahl and his wife, in quest of a genuine return to nature, set foot on the island to live like at the dawn of the new world. Not much has changed. Today, most local people live around the village of Omoa where they make traditional and renowned tapa out of tree bark. Hanavave is sheltered within an amazing bay: the Bay of the Virgins, probably one of the most beautiful bays on Earth, especially at dusk when the light blazes the volcanic peaks turning the landscape into an unreal and unforgettable scene.